If you had told me three years ago that I was going to run a 50 mile race, I would have called you crazy. 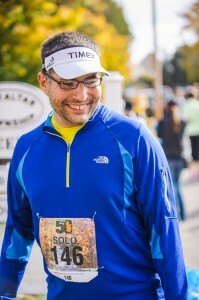 Okay, no, I would have said, “50 mile race you say…” and rubbed my slightly chubbier chin. I was born to go long. I’m still trying to figure out just how long that is. All I know for now is that it was an incredible experience to run 50 miles along a picturesque portion of Lake Michigan shoreline last weekend. The weather was perfect. The people were fantastic. I ran with friends and made new ones. The tale is epic, so grab a cup of your favorite warm beverage (or beer, or wine) and join me as I recount the weekend’s highlights. I awoke before my 4am alarm clock duet had a chance to chime. 4 minutes of grace for my sleeping wife and kids. I grabbed the headlamp that I own for future running adventures and began to gather my gear/clothes/food for a one-way bus ride to Gills Rock, Wisconsin. If Door County is the “thumb of Wisconsin” then Gills Rock is the thumbnail. The pre-dawn hour was misty and cool when we boarded the busses. They checked our names off a passenger manifest as we boarded. The whole thing had an ominous feel to me, like a scene from the movie “Titanic.” I almost remarked as much to the bleary-eyed fellow next to me, but thought better of it. Not everyone shares my morbid, early-morning humor. 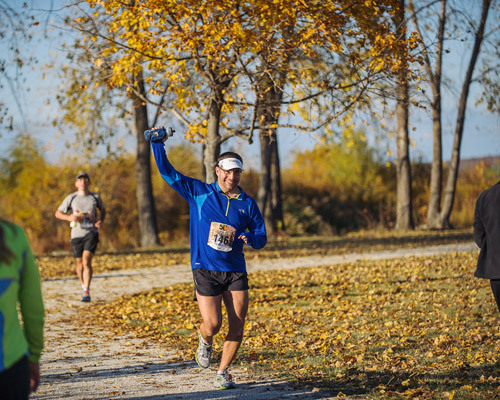 The start of the Fall 50 ultramarathon was different than at any other race I’ve attended. People weren’t striding out and stretching. There wasn’t much bouncing or jostling. We were a chill bunch. In 50 miles there’s a lot of time to get loose. I warm up on the run. I wasn’t alone in this. I’m not saying there wasn’t energy. You could feel the energy, and a little bit of fear, in the air. It was deep and subtle, but it was there. Ultras are a game of patience I was told. You need to hold that excitement and fitness you’ve build in check for a long time. We didn’t sprint from the line, we shuffled. The race wouldn’t start REALLY start for several hours of running. So why oh why did I find myself running a minute faster than I had planned? Of course I will shift the blame to others. 2 months ago I didn’t know a single other Fall 50 participant. Then in one week I met several in ways too varied and at a rate too rapid to be random. So when I toed the line at 7am there were 4 different contingencies to choose from for running companions. Two of them were too fast for me. Well really three, but it was that last not-quite-as-too-fast-for-me-friend that lured me away from the more conservative bunch I had planned to run with. It actually happened more organically than that. I got talking to my new friend Aaron at the start. Then we were joined by another friend of his. Then some random guys joined us. It all kinda just happened. When Aaron told me what pace we were running, red flags went off in my head, but I didn’t want to be rude and leave our little make-shift community. After a few more miles of this I decided I needed to drop back. “Well Aaron, I’m gonna ease off the pace for a while.” I dropped back to look for the conservative group behind us. They were nowhere to be seen. So much for that. 5 minutes later I caught up to my original group. They greeted me with mild amusement. Meanwhile I continued to wonder if this wasn’t a huge mistake (starting out so quickly). At the second aid station around 11 miles I stopped I decided it was time to make you all my readers of Real Men Show Leg er… proud. I lost the wind pants to reveal far too much leg. I also lost Aaron. But shortly thereafter I made new friends. I met a man and woman from Indiana. I had met them earlier in the race when I complimented Drew on his snot rocket technique. I asked if he had read the article in Runner’s World about how to blow the perfect snot rocket. He had. When I passed them this time around I acquired a new nickname: hot legs. I believe the woman cat-called as I left and said something around the lines of “Momma likes!” Yikes. Jamie later overheard one woman say to another at an aid station, “I hope that guy with the nice thighs runs by again.” She was talking about me. I’m still not sure how I feel about all of that; perhaps mildly flattered and deeply disturbed sums it up. In the book, “A Million Miles in a Thousand Years,” (affiliate link) Donald Miller uses a metaphor of a boat going on a voyage to describe any new exciting venture in our lives. Launching off from shore is exciting. The coastline we depart disappears quickly. Progress is rapid and exhilarating. Then you get to the middle. If feels like you’re going nowhere. There is no land in sight, no way to measure your speed or progress. It seems to go on forever. Then suddenly when land is in sight, everything changes again. Everything accelerates to the landing. 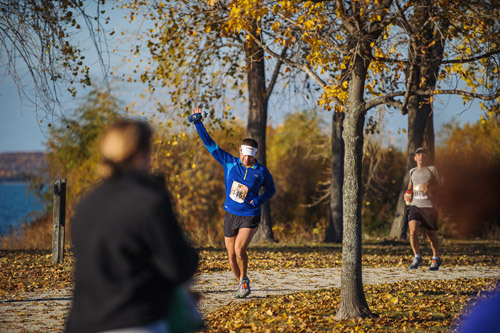 The Fall 50 was started as and remains to be primarily a relay race. Teams of up to 5 people either set out to blaze the course as fast as they can, or make a party of it, dressing in outlandish costumes. These teams are divided in three different starting waves. The solo runners started at 7am (sunrise). The relay teams started at 8, 9, and 10am based on their anticipated pace. The 10am (AKA “Jackrabbits”) teams caught me first. I knew it was coming, but it still bothered me. They started at the same place 3 HOURS AFTER ME! Granted, they did only have to complete 10 miles, broken into 2 segments, but this did little to assuage my pride when the first of the jackrabbits FLEW past me. Release the Nicest People Ever! I’d been warned about the relay teams passing me. I was also told that I would love it. I did learn to respond to the name “Solo” as the relay teams passed. Even if it wasn’t on our bibs, we were pretty easy to spot, with our water bottles, belts, and dilapidated running strides. 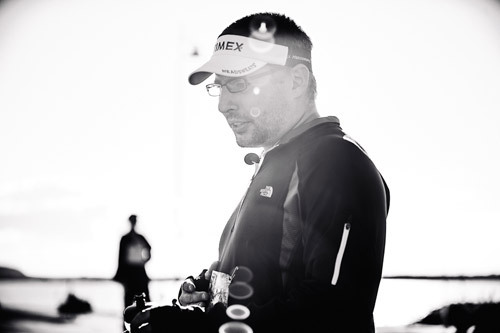 I’d say that well over half of the people that passed me told me how well I was doing, how my stride looked smooth, to keep it up Solo, etc… A few people went further and offered water, candy, gels, or anything else. Aid station volunteers rushed up to me when I entered a station asking what I needed. Usually, I just muttered, “Water” like a man crawling in the desert, but I was thankful. Here’s where I gripe about how much it hurt and where I had chafing etc. I’ll sum it up quickly. I didn’t have chafing anywhere. Thanks Body Glide!! Little pains came and went over the distance. Only one of them seemed serious. My IT band was locking my knee up starting at mile 27. I would run, stumble a little, walk, hobble, run, and repeat the process. I thought I was doomed to walk the rest of the course. It wasn’t how I wanted to finish, but these things happen. Thankfully I didn’t have to. Aaron’s wife and my wife crewed for us during the race. They met the night before at the spaghetti dinner we attended. So when news traveled from my wife to Aaron’s, she gave me 2 ibuprofen and I gladly accepted them. In two miles the pain was gone and I was revitalized. It’s amazing what that kind of pain does to sap your strength/energy. After that I was good the rest of the race. Others did not report the same. The thing that made this race so vastly different from running a marathon was the camaraderie, or comradeship more specifically. I made a point of asking every single solo runner I passed how they were doing. I end my story as abruptly as the race ended. In fact the race was very much like this post. Super long and then suddenly over. It took my mind at least 10 minutes to fully register that it was over. 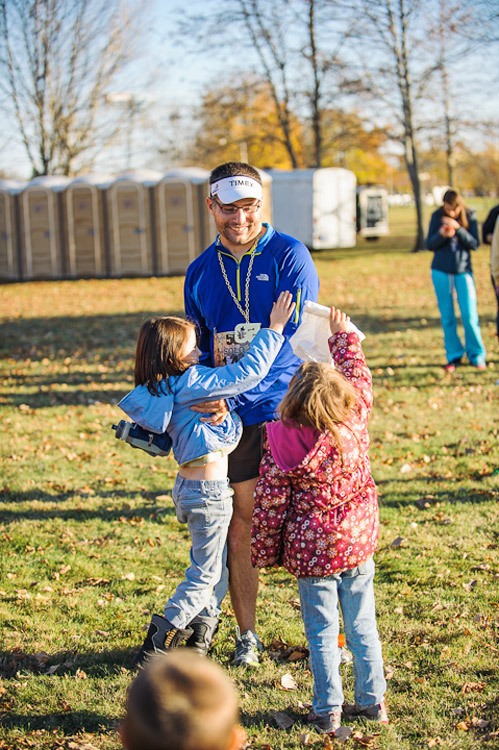 My wife and our three kids rushed me at the finish. We fell over each other and embraced. My wife and I wept together. During this a friend came over to congratulate me. I hastily wiped a few tears, but couldn’t hide them all. I didn’t really care to. I was so grateful to embrace my team, my family at last. That was the word that sums up my experience and was the answer to my mid-race question, “Why am I doing this?” When I run I retreat into myself and find that I love my life. I love my family. I take off my referee’s cap and find that I am deeply grateful that God gave us three vibrantly intelligent and lovely little people. At the finish they were the ones I want to see more than anyone in the world. My son Soren (3) gave me a rare kiss. My daughter Madeleine (6) beamed brightly and told me how proud she was of me. My other daughter Britta (5) gave me a paper bag of “pretty things” (leaves, flowers, sticks) that she had collected throughout the day as my “special prize.” It was awesome. To my wife, Jamie: I love you so much. 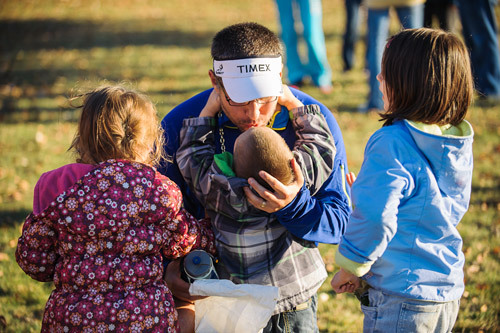 I’m so very thankful that you give me the time to train for and participate in these races. I wouldn’t, couldn’t do it without your blessing and you give it so freely and lovingly. I don’t know. I drifted aimlessly for a good number of days after the race. I didn’t blog. (sorry) This race consumed my imagination for many long months. I’m going to take time off from race specific training. I’m gonna run less, bike and row more. I’m going to strength train. I may even do yoga again for a while. I also wage a full scale war against overeating. I’ve been tracking calories again. Somedays I win, some days I lose, but I won’t give up. Will I run another ultra? I waited at least a week before I even asked myself that question. The answer is YES. YES I WILL. I’m not at liberty to discuss my next ultra race, but when I know, you’ll know. Maybe you’ll run it with me. See you at the finish! Oh, forgot to say that those are some of the most gorgeous race photos i’ve EVER seen. Jamie/Brandon – It might be time to reach out to a few local races and expand beyond your current clientele. Aw, thanks JL! Problem is, I’m guessing they’d want boring finish line images. Or maybe we could just take promo shots for them of the race in general. It was REALLY fun to document the day. One of my favorite photos isn’t even in this post – the kids all asleep at 5:01am – but it’s in the fb gallery if you want to check it out. It’d be totally fun though! Thanks for your kind words! Way to go!! I don’t think I’ll ever do an ultra, but I’m so impressed by people who. Congrats! It’s interesting, reading your post it makes me remember my first finish line and it was only a 5k. Your post brought me some tears of excitement for you and a desire to be able to run again. I’ve been away from running for 2 years now with a serious injury. I’m so close to hitting the pavement again, that coupled with stories like this, makes the excitement overwhelming. Friends have asked me why I run long distance and they don’t understand. Truth is the high is just something that can’t be explained. I can only imagine what kind of high 50 miles brings! Wow! Congrats! Enjoy. Such a small percentage of the world even attempts to achieve 1/5 of what you have. You’re an inspiration. Relish in that. Deeper lows, higher highs in a 50 miler. It’s tough to explain running to “running haters.” I think there are more people out there that would enjoy running if they gave it a long enough chance or altered their perception of what a run must be. You don’t have to run the whole time. Take breaks to walk, enjoy the scenery, take a picture, whatever. People should tell their inner track-coach to chill-out more often. It’s not about pace or PRs, it’s about the love of running. It pains me to hear that you get it, but can’t do it yet. I hope your recovery continues to go well. Brandon, I just stumbled upon your race recap. 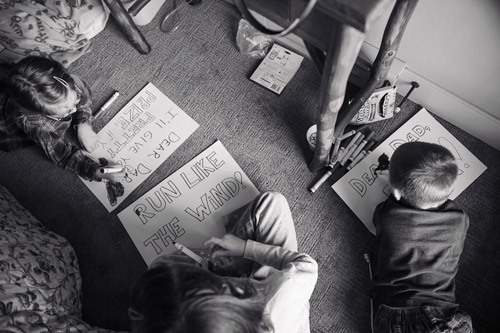 You portrayed the intermingling of the ultra-marathoners and team relay participants perfectly! I’ve always said that part of the magic of this event (simultaneous relay and ultra) is that both groups draw inspiration from one another. 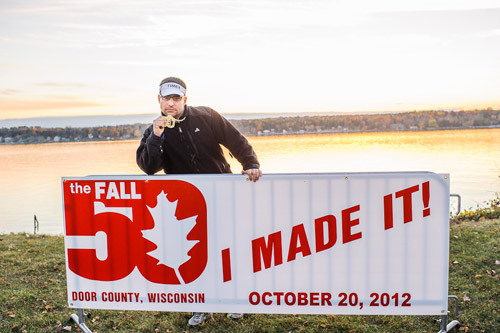 Thanks for making the Fall 50 your first Ultra! We hope to see you again some time in the future. Thanks for the comment Sean. I learned about the race while I was running Cellcom last year. It’s got a great reputation for a fun end of year event… thought you’d like to know (if you didn’t) that you’re doing something very right there. I really loved my time there. Keep up the good work. I’ll be back there again some day. 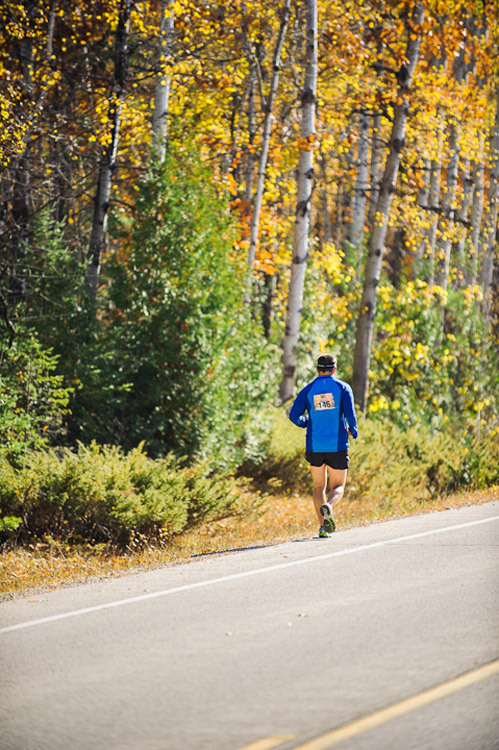 This year’s schedule has me chasing my first 100 miler(the Superior 100) so I won’t make it, but I am a glowing advocate to other runners I talk to about the Fall 50. I think it was the perfect choice for my first ultra.